As we all know the Mega Event of centuries Fifa WC 2018 is just about to begin. 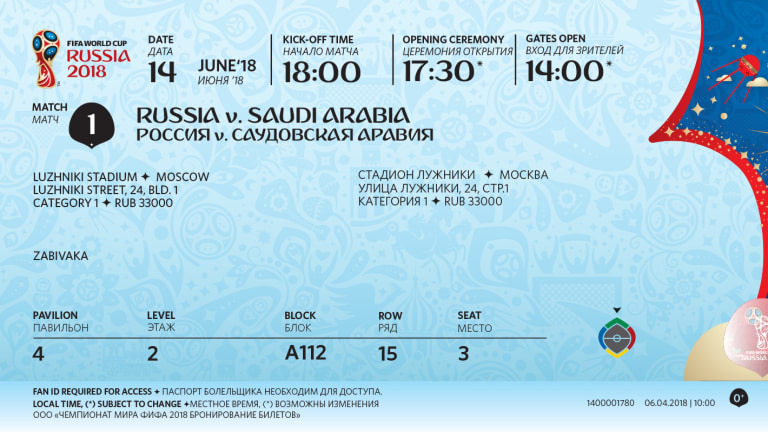 Fifa has officialy announced new design of the tickets for Russia World Cup 2018 which will be in market soon from this month. Technology has been implemented in the design as barcode will stop from duplication and hologgram will define the postion of the seat etc for Russia WC Fifa 2018. Ticket also has complete detail in English and Russian about the venue , time and gate. All gates will be opened three hours before the match start and as Russia is in cold region it will give spectators hot shot in each goal. Each ticket is categorized and will help viewers to find their seats easily. Terms and conditions are stated so avoid to break any law.